These are the remarks made by the DA’s Athol Trollip who was this morning inaugurated as the Executive Mayor of Nelson Mandela Bay Metropolitan Municipality. The people of Nelson Mandela Bay voted for change. They have endorsed our offer of stopping corruption, growing our economy to create jobs and for better service delivery. This will be the lodestar and mandate of this new Multiparty DA-led administration. Nelson Mandela Bay has a rich history of reconciliation and this has once again manifested in democratic change and hope for hundreds of thousands of residents to whom we owe our collective thanks and our commitment to work together for their collective and individual benefit. Our city was the first in the country to establish a Transitional Local Council, prior even to the momentous 1994 election, which saw all councillors, from all parties, sign the one city agreement, some of whom are with us here today and to those who aren’t, we pledge today to continue on the path of reconciliation and nation building that you pioneered all those years ago. People like Govan Mbeki, Raymond Mhlaba, Angelo Dashwood, Nceba Faku and Bobby Stevenson all worked together tirelessly to undo the legacy of our painful past, and for that we remain eternally grateful that you set the standard for a non-racial and unified city. After having lost our way and after this election, it is our responsibility to continue this legacy and to set a new standard for better governance and service delivery for all the citizens of this city. This is an incredibly exciting time in our political history, as we begin a new phase of Multiparty endeavor to free ourselves from the impact of decades-long maladministration and corruption that have bequeathed us with record unemployment and poverty. Change, though constant, is never easy, especially when one political party has been so dominantly hegemonic for so long. This is what happened post-apartheid and it was good for our country and city. As will this change be good for our city. Coalition governance has become a phenomenon across the world and is fast shaping the contemporary South African political landscape, and just as the late President Mandela’s first cabinet included representation from a variety of political parties, so too does the newly-established Multi party government in Nelson Mandela Bay, led by the DA. This is testimony to the hard fought determination by the coalition partners to arrest the downward trajectory we have been in and to convince voters that change was needed, I am honoured to be part of it. It is humbling that in the city named after our iconic President, Nelson Mandela, that it is now our responsibility to cooperate with other opposition parties in the spirit of reconciliation and redress to deliver good governance to the people of this city. I witnessed the excitement and will of the people regarding reconciliation and cooperation in front of City Hall on Saturday the 6th August 2016, where over 5000 residents joined hands in an overwhelming endorsement of change. It was a sight that would have made our late National hero so proud and one that will be indelibly imprinted in my mind. It was the manifestation of the rainbow nation that he conjured up in the minds of all South Africans pre and post 1994. After too many years of broken promises, I once again felt a new sense of hope; a visceral expression of unity. Just as we did in 1994, we have again used our vote to change course and to choose change and hope. The almost 180 000 votes cast for the DA in the Bay were not only won by our campaigning efforts over the last year, but are also as a result of our Party’s long and illustrious performance in opposition in this Council and in this regard I wish to pay tribute to those that went before us who systematically grew our image and credibility as an alternative government – thank you, you were the ones that laid the foundation for this occasion. Beyond our reputation in opposition, we have also developed a reputation in government that we are really proud off. We have shown the people of South Africa that where we govern, we govern well. This is recognized, not only by National rating agencies and the Auditor General, but by International rating agencies too. More importantly though this has been recognized by you and especially the electorate who live in DA led municipalities. This is reflected in our ever increasing support. We have a lot of work to do here in Nelson Mandela Bay, and it starts right here, right now. Over the past year I have committed to delivering three things if elected as your Mayor and now that this has come to pass, I must fulfil what I promised. No elaborate grandiose promises that have little prospect for ever coming to fruition. Corruption is the enemy of freedom and fairness and the thief of opportunity. There will be no more erosion of municipal resources due to corruption procurement practices. There will be no more wasting of our resources on the glitz and glamour of irrelevant pubic events, flashy cars and wasteful expenditure on cadre deployment. This municipality’s money will be used effectively by stretching every tax rand to achieve optimum outputs in the direct interest of every citizen. We will establish an efficient, effective and highly skilled administration. One that is nimble and that will facilitate and attract the investment so desperately required to attract and sustain economic growth to get our city working. The days of costly and duplicate mayoral satellite offices are over, as this new government will be in touch with communities through their elected councillors and their funded ward offices and a Mayor who will be on the ground with the people. This is the way a functional local government should work and will work. We will respect all legislation pertaining to Local Government and we pledge to enforce the law and function strictly within its boundaries. Any official or public representative found to be operating outside the rule of law will be charged and will have to account for their actions or derelictions in the relevant courts of law or within the municipal disciplinary structures. In this regard let me state categorically that those officials who do not hold the prerequisite qualifications for the job they are in or who were appointed irregularly will have their appointment carefully scrutinized and if found to have been appointed outside the ambit of the law, will have such appointments terminated. All ongoing disciplinary matters will be prioritized and finalized at the earliest opportunity. All outstanding forensic audit reports will be tabled and acted upon and we will have no reservation in conducting further forensic audits of irregular contracting and appointments if and when necessary. We will engage with National Treasury to ensure that the forensic audit of the defunct IPTS can reach finality as soon as possible, so that we can work to resolve this R2.5 billion impasse that has yielded nothing in return to the benefit of this city. We will have to make these decisions dispassionately based on relevant and appropriate professional advice on whether to try and redeem this project or to scrap it. I pledge to do this as soon as possible. Political instability in this Metro has rendered this city moribund and unresponsive. It is time to lock the revolving doors of corruption, cadre deployment and cronyism and bring about a new model of administration by this multiparty government that will eschew the blight of such practices and that ushers in a model of good government based on best practice that we believe the DA administrations have become in South Africa. Unemployment in Nelson Mandela Bay has spiralled out of control. The youth of our metro are finding it harder and harder to find work and access to opportunities – this is unacceptable. Youth unemployment is at 47% meaning one in two young people are without work and every day, week, month and year that passes by, their chances of finding work diminishes drastically. The official total unemployment rate in NMB is 33%, 7% above the national average. This must be arrested and turned around as a matter of urgent priority. Our metro is filled with abundant and untapped economic potential that can be converted into job creating and economic growth. We need a new, bold and dynamic vision for our economy – a vision that provides for infrastructure investment that not only maintains our existing infrastructure but that will allow for the development of new infrastructure. That will attract and sustain economic investment. That will create jobs. That will help us exploit our enormous tourism potential. That will stimulate our diverse province agricultural economy and that will promote the growth of SMME’s especially in our neglected townships. Tourism will be a major focus of this new administration. We have not nearly exploited our full potential as a tourism destination and I will prioritize this as part of our economic growth plan. 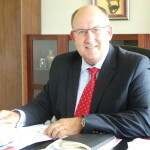 Under this new government in conjunction with the Eastern Cape provincial Government and neighboring municipalities, especially the DA led Kouga government as well as the DA led Western Cape provincial and municipal governments, Nelson Mandela Bay can become the next best tourism destination in South Africa and create thousands of new jobs. It has always been anathema to me why this City doesn’t benefit more from being the entry and exit point of the Garden Route. We can be much more proactive in leveraging our pivotal geographic position. We need to grow our economy by attracting investment from a much more diverse basket of potential in order to exploit this city’s full potential. A stable political environment combined with a forward thinking and jobs focused government, will attract the right investment to grow our economy and create jobs. We will need to work better with the existing business sector and encourage them to reinvest in our city as well as attract new investment to ensure economic diversity. In order to facilitate investment into the Bay we will establish a ‘One Stop Shop’ for all business related municipal queries and applications. The objective of such a service would be to cut red tape and reduce the turnaround time of applications to the municipality that currently serve to impede economic growth and job creation. A focus on SMMEs is critical to any successful jobs plan. I have personally witnessed the struggles of too many small business owners who are not getting the support they require to climb the ladder of opportunity. Given the right support small businesses have the influence to empower and employ while providing freedom and opportunity to thousands of residents. The concept of Vukuzenzele remains just that in NMBM. A concept or an empty philosophy. In order to closely monitor and evaluate our commitment to job creation I will be establishing a jobs desk in the Mayor’s office to ensure that jobs tops my daily agenda. This desk will facilitate queries and process applications for municipal bursaries as well as open a channel to incentivize businesses to employ first time job seekers; every possible avenue in this regard will be explored including the possibility of introducing a youth wage subsidy. We cannot continue bleeding the best young minds from this city to other growth and opportunity destinations elsewhere in the country. Our youth are our future. We must take care of them now. As the Mayor of your new government, I undertake to provide dignified sanitation to all communities by the end of 2017; it is time for this Metro’s 30 000 bucket toilets to go!! We will also embark on designing and budgeting for a sustainable and dignified sanitation system in the burgeoning informal settlements in our city. What we cannot have are communities that are decades old still using the bucket system. Let alone having communities in new housing developments having to use buckets. Without a single title deed handed out by the municipality in 2013/14, it is no wonder that national government was forced to intervene on the eve of the election in this Metro to hastily hand out title deeds. We intend to restore confidence in the Metro’s human settlements directorate so that we ourselves can construct proper houses that meet the NHBRC prescripts and hand over homes, with title deeds according to a housing list that is publicly displayed at all municipal offices. We plan to act in concert with national treasury and the National Department of Housing to uproot every practice of vice fraud and corruption in the municipal human settlements department. All funded critical posts directly related to service delivery will be filled with competent and suitably qualified people from all communities before the end of 2017. Sadly our city has become known as one of the dirtiest cities and this is compounded by our notorious coastal wind that spreads the litter far and wide and into our ocean. The filth that has accumulated on our streets and in our communities through illegal dumping is unacceptable and unnecessary. Illegal dumping has been exacerbated by erratic refuse collection. We will deliver a clean, caring government in Nelson Mandela Bay that will work towards weekly refuse collection in all wards before the end of the year. This is an endeavour that will not only clean up the neglected communities of this city, it will also be an important job creation initiative. We will ensure that this city looks different from Kwanobuhle to Colchester and from Wells Estate to Walmer. We don’t have to live in a filthy city nor do we have to tolerate substandard service delivery. Transparency and honesty will become the trademarks of the Nelson Mandela Bay under this new multiparty government. We will show the citizens of Nelson Mandela Bay that we can and will work together in their best interest. Best practice will be implemented here, using blueprints from the Western Cape and other DA-run municipalities. We will work with all spheres of government to guarantee better services and economic growth that creates jobs. Safety and security remains a great concern in the Bay. The scourge of gangsterism, drug abuse and alcohol is rife in many poverty-stricken communities. Thus, we will operationalize and bolster the newly launched Metro Police Service, making sure that our officers are appropriately trained and that they meet all regulatory requirements as outlined in the Police Services Act. We will boost the Metro Police budget allocation so as to be able to establish anti-drug and –gang units, tasked with stabilizing some of the Metro’s most dangerous areas. No longer will communities have to live in fear of unbridled gangsterism that has destroyed the fabric of society and so many families in the Northern Areas in particular but not exclusively as this cancer is spreading across all communities in the city, especially where unemployment is at its worst. The roll out of social and early childhood development programs will be critical to preventing our youth from being sucked into a life of crime. I would like to appeal to all parties today to work constructively in the new Council to achieve these objectives. The education crisis in the Northern Areas must be addressed and the phenomenon of children commuting from certain communities, leaving empty classrooms and underutilized teachers, to certain schools that are overcrowded and severely under resourced will have to be dealt with head on in conjunction with the Provincial department of education. The multiparty government and the other opposition parties may be political adversaries but we need not be enemies. I truly believe that we are better together. While the government will serve the interests of everyone, regardless of who they voted for, we can best do that if every constituency has a credible and constructive voice in this Council. I will ensure that such a political climate will prevail where we can all fulfil our political responsibilities. This election has shown us that the voters have rejected the politics of racial division, race-baiting, and cheap gimmicks and have embraced the politics of reconciliation, redress, delivery and diversity. This marks a new era for metro government in South Africa as change rings out in the country’s biggest cities. We look forward to the full expression of our democratic mandate by implementing our manifesto of change and by working together for all the people. This also means that we will work with all the officials of this municipality to fulfill the responsibilities of local government as per the Constitution, The Municipal Systems and Structure Acts, the MFMA and all the by-laws of this City. I want to be totally unambiguous with regard to my philosophy of treating professional civil servants professionally. I will ensure that there will be no political interference in the professional work space and that each and every official will be treated fairly and with respect. In return I will expect the highest standard of professionalism and dedication from each and every official. I would like to thank and pay a special tribute to the voters of this City that took their responsibility of being the custodians of our democracy seriously and who came out in inclement weather conditions to vote for change. Thank you. I want to thank our political partners who have decided to be part of change in this historical political agreement to bring good governance to Nelson Mandela Bay. I want to thank the DA and you that have entrusted me with the enormous honor and responsibility of being your Mayor. I am humbled by the fact that we are now mandated by the citizens of this city and the members of this Council to work together as citizens of this city for the citizens of this city. Lastly I wish to thank my family, my friends, my colleagues and staff members of the DA who sacrificed so much, who supported me unconditionally and who worked so hard to make this occasion happen. I will not let your down as the Mayor of Nelson Mandela Bay.